Final data are now available showing that Arkansas Taxable Sales rose sharply in the third quarter of 2015. The basic measure of taxable sales — derived from state sales tax collections — increased by 3.0% from the second quarter to the third (seasonally adjusted). 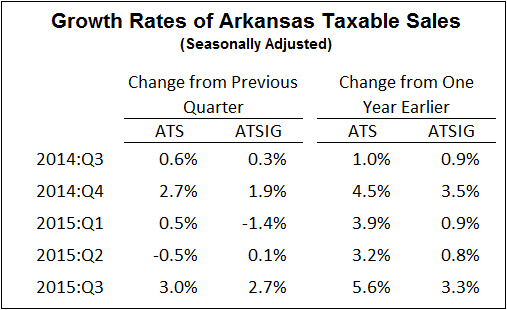 On a year-over-year basis, Arkansas Taxable Sales (ATS) was up 5.6%. Sources: Department of Finance and Administration, Oil Price Information Service, Institute for Economic Advancement. Falling gasoline prices continue to suppress the growth of total estimated spending on gasoline. Arkansas gas prices averaged $2.28 in the third quarter, down from $2.40 in the second quarter. As a result, spending on gasoline declined by 1.1% from the second quarter to the third quarter (seasonally adjusted), and was down by over 25% compared to the third quarter of 2014. 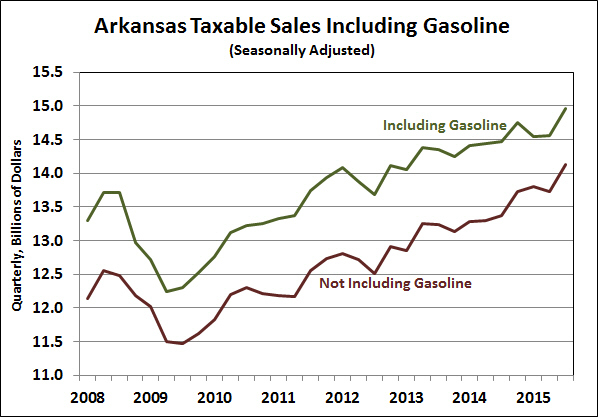 Accordingly, Arkansas Taxable Sales Including Gasoline (ATSIG) rose at a slower pace than ATS. From the second quarter to the third quarter, ATSIG increased by 2.7%, and was up only 3.3% from the previous year. Arkansas Taxable Sales (ATS) is calculated by the Institute for Economic Advancement to serve as a timely proxy for Arkansas retail sales. The series is derived from sales and use tax data, adjusting for the relative timing of tax collections and underlying sales, changes in tax laws, and seasonal patterns in the data. Arkansas Taxable Sales Including Gasoline (ATSIG) incorporates data on the state motor fuel tax and gasoline prices from the Oil Price Information Service. A spreadsheet of the monthly and quarterly data is available here: Arkansas Taxable Sales 2015:Q3 (Excel file).